I had such fun working on this collection and found it difficult to keep it a secret! As I considered all the elements that would be required I digitised matching buttonholes and scallops with tiny scalloped edges and a series of running stitches to finish them off. 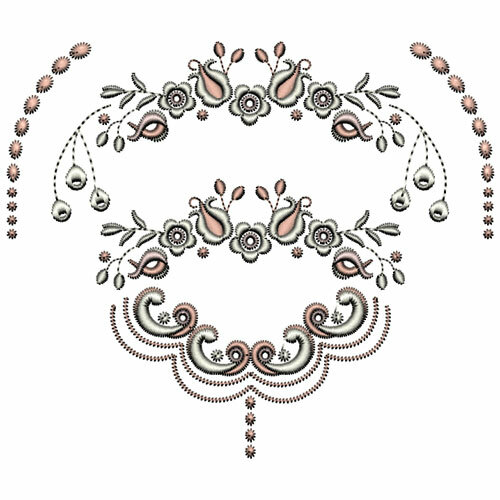 Imagine a panel of these with silk ribbon threaded through as shown below. 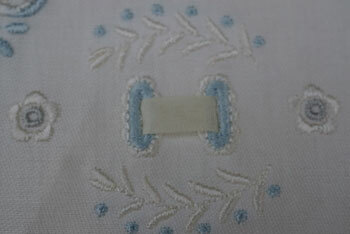 The photo here shows GFE-UPP-1-13 stitched in an alternative colour way using pale blue and silver threads. 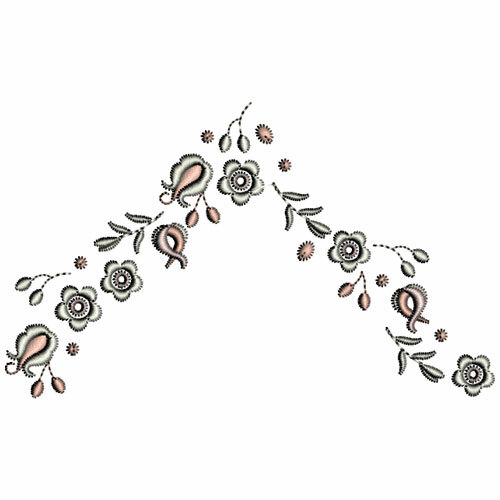 Every heirloom collection needs a cross and some small motifs which can be used in their own or within other larger designs. 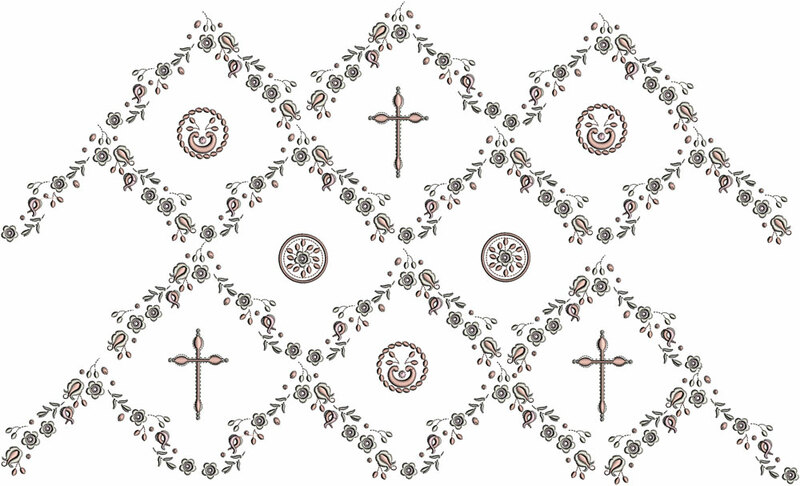 I hope you like the simple cross which has a series of running stitches around it, to set it off. My last challenge was to create a small design which could be used to create an all over effect suitable for bodices and larger panels. 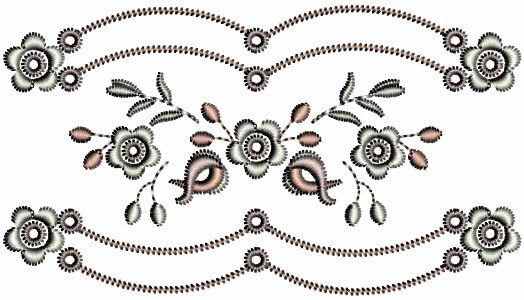 Maybe you could use it to create your own embroidered fabric! 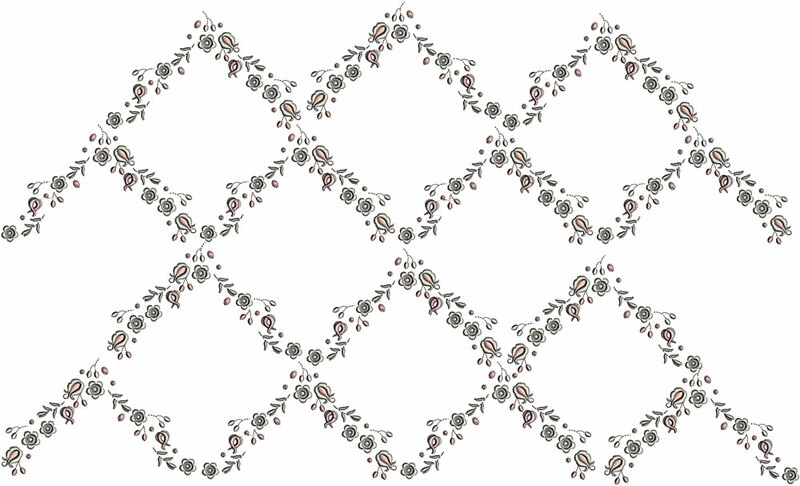 This simple design works like a jigsaw piece and can be used to create these combinations. 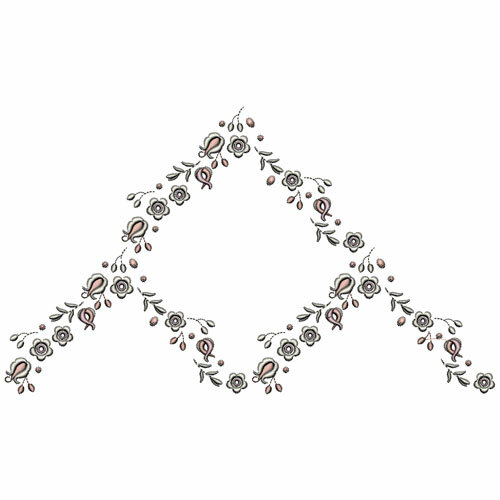 Or you could place some small motifs inside the diamond shapes that are created. If you do purchase these designs and create something very special do send me photos that I can upload into the galleries on my website. This entry was posted in Discussing machine embroidery, Inspirational, New Designs and tagged Heirloom, machine embroidery, The importance of colour. Bookmark the permalink. Wow, Hazel! These are incredibly beautiful. You certainly are a very talented lady. I shall be buying some of these. 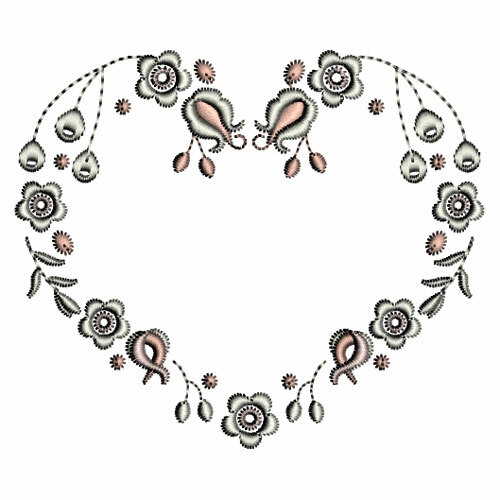 I am starting my own sewing business and plan to teach as well as create beautiful bespoke object, heirloom sewing being a particular love of mine. These come in at a really good time as I also have 3 babies in my family circle, and hope to make items embellished with your gorgeous designs. Thank you for the freebie which I shall be trying out very soon. Should you check, you won’t recognise my e-mail address as Virgin does not allow me to send out on the .net account anymore – they are getting rid of them although we can still receive e-mails. The first sets, UPP-1 & 2 were equally as beautiful. When I look at design sets, I am always looking for as many places I could find a use for them as possible. I have found all of Hazel’s sets remarkably well priced and have plans to use some of the smaller designs in some (including UPP) as upscale designs to my doll clothes that I am going to make. Can’t say how beautiful these are in my head… LOL! Hope others see the same things as I do.